Today I used a wonderful color combination from the design team over at Pals Paper Arts. What do you think now? I'm lovin' it! I took the colors of the challenge and put them on top of a Sahara Sand card base. 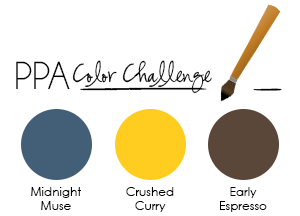 I chose to highlight Early Expresso and just use small doses of Midnight Muse and Crushed Curry. I used the Autumn Accents Bigz Die to die cut my leaves and then stamped onto the die cuts using the Wonderfall Stamp Set (and my trusty Stamp-A-Ma-Jig). I added some twine, but still...something was missing! So I looked and looked and found the new 1 1/4" Burlap Ribbon from the holiday catalog and knew that was the missing element! I snipped and tugged at the threads until it looked right...and then realized that it HAD to be sponged too...lol. Whew! I thought the Early Expresso button with a twine bow was the perfect final touch. So what about you? Are YOU ready for fall? Have you decorated? I think, after this card, the juices are flowing and it's time to dig into those decorations! I hope you have enjoyed my post...thank you so very much for stopping by!